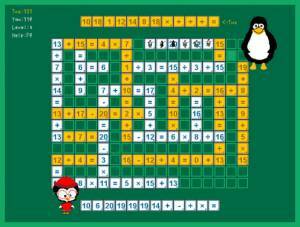 TuxMathScrabble Asymptopia Software, Asymptopia Software, 2001 Download it Now ! TuxMathScrabble is a math version of the classic word game "Scrabble" (Trademark of Hasbro,Inc) which challenges kids to construct compound equations and to consider multiple abstract possibilities. There are four skill levels for practice, from basic addition with small numbers, through multiplication and division with larger numbers. The game can be played by 0, 1 or 2 human players. Player submissions are made by dragging tiles to the gameboard and pressing the "okay" button when ready to be validated. Invalid submissions are thrown-back to the user's tray.